Will the St. Louis Blues See Klim Kostin This Season? The St. Louis Blues are in a strange position. After reloading their forward group in the offseason, they are unexpectedly near the bottom of the league, only a few points out of last place in the NHL. The problems are myriad, and their decision to fire head coach Mike Yeo a month ago did not result in the drastic and immediate turnaround that many hoped for. Now, unless they can improve very quickly, the Blues are looking at their second consecutive season without a playoff berth and with a very high draft pick. The question is, how can they make the most of a season that has fallen far short of expectations? While there are many ways to answer that, one question fans will continue to ask is how soon will they see former first-round pick Klim Kostin? The Blues made an unexpected move late in the 2017 NHL Draft when they traded longtime enforcer Ryan Reaves to the Pittsburgh Penguins, along with a second round pick, in exchange for Oskar Sundqvist and the 31st overall pick, the final selection of that year’s first round. 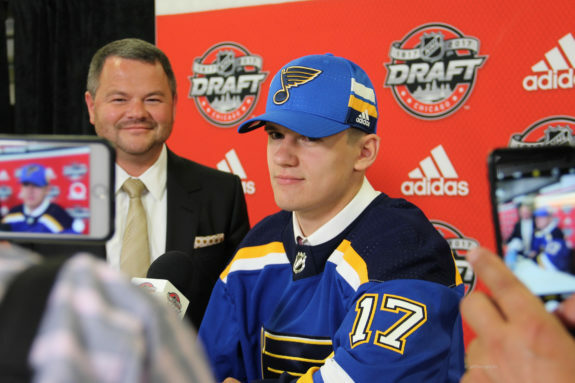 With it, the Blues chose Kostin, a Russian forward who was considered a high-caliber prospect. 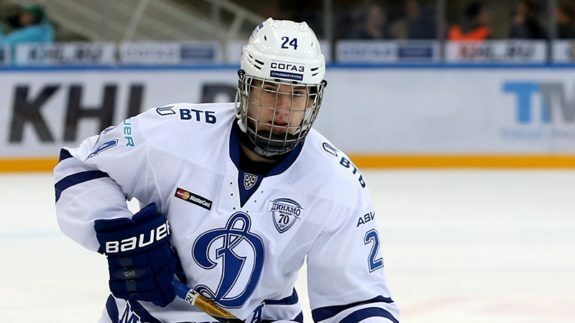 Projected as high as a possible top-three pick before his final pre-draft season, Kostin fell in the 2017 draft after he missed considerable time with a shoulder injury. 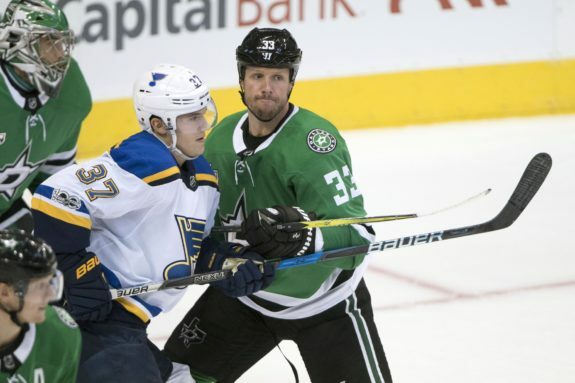 It was enough for 30 teams to take a pass on him, but the talent level, which has drawn comparisons to countryman Evgeni Malkin, was too tantalizing for the Blues to pass up. They made the trade, got the pick, and took their man. Kostin struggled in his first season in North America (2017-18), but there were plenty of reasons why: he was returning from a long absence for one, and he was learning the American game at the same time. Finally, the Blues lost control of their AHL team for the season thanks to the arrival of the Vegas Golden Knights and they had little control over Kostin’s playing time or his role. He was relegated to the fourth line a lot and wasn’t able to show his skills. Despite the struggles, we ranked Kostin as a tier 3 prospect entering this season in our Blues prospect pyramid. He might have been even higher but for his NHL readiness, which was deemed low at the time. Despite a strong performance at the World Junior Championships last season (a tournament he will be in again later this month), there wasn’t much reason to believe he was ready for the next step. This season, Kostin is rounding into form. We should remember that, while he’s entering his second year in the American Hockey League, he is still one of the youngest players there. The vast majority of NHL prospects are drafted out of the Canadian Hockey League, the group of three major-junior hockey leagues in Canada, where players between 16-20 hone their craft. But those players are not allowed to leave the CHL for the AHL until they “graduate” from the CHL at age 20. Kostin is different because he was drafted directly out of Russia. Though he was selected first overall by the Kootenay Ice in the 2016 CHL import draft, he never made the jump to play in that league, preferring to remain in his native country. Therefore, he could jump directly to the AHL at 18, making him one of the few players in the league under 20. Despite his age, Kostin is beginning to show his skills at the AHL level. He is a great skater with considerable size, at 6-foot-3, 212 pounds. The Rampage haven’t been scoring much and it shows in his stat line, with just nine points in 26 games, but his talent is shining through more and more frequently. More encouraging still is his determination to reach the NHL. With Russian players, there is often a nagging fear that they might seek greener pastures in the KHL, but that doesn’t seem to appeal to Kostin. In an interview last season, he spoke about his desire to reach the NHL, but does it make sense for the Blues to give him that chance this season? Despite a few victories in the last week, the Blues are on the wrong side of the standings and have a significant hole from which to dig themselves out, particularly considering all the injuries they’re facing. They have given increased opportunities to Robert Thomas and Jordan Kyrou in these circumstances, might they extend the same chance to Kostin? In the short term, the answer is no. Kostin is expected to join Team Russia again at the WJC at the end of the month, so the Blues won’t call him up before then. But another strong showing with his national team could earn him a serious look from Blues’ management, particularly if they continue to struggle with injuries or poor performance. It is Kostin’s responsibility to stay focused on the task at hand and show the team that he’s ready for his call-up. If he can do so, it shouldn’t be long before fans see him again at the Enterprise Center. Kostin had a taste of NHL action in the preseason, but could the Blues look at giving him a chance later this year? It won’t be until January at the earliest, but the answer should be yes. He is a young player that the Blues’ organization is very high on, and if the team is struggling and has a role for him, they may give him his first shot at living his dream at the highest level. But fans shouldn’t be disappointed if it doesn’t happen soon. Kostin’s future is very bright, and he’s still very young. Another full season in the AHL will only help him, as he continues to adjust to the North American game and the professional style he’ll be called upon to play. Whether it’s right after the World Juniors or isn’t until next season, Kostin’s time is coming.